When the South Korean government decided to build a naval base on the site of Gangjeong Village, a notice was sent out in 2007 and a quick vote taken (measured by applause) with a turnout out of a few dozen residents, out of a population of over 1000 and the measure approved. When the villagers realized what they had agreed to, they booted the mayor out of office, elected a new mayor who opposed the base and have been struggling against proposed naval construction ever since. In a subsequent vote the same year 724 villagers voted against construction of the naval base. Gangjeong Village has been declared a UNESCO World Biosphere reserve, and Jeju island a UNESCO World Natural Heritage. Yet this conflict rages on and its fate may be decided soon. A group of filmmakers created a cluster of shorts that tell the story of the conflict at Gangjeong Village from different perspectives, but also portray the natural unique beauty of the coast of the northernmost semi-tropical island in the world. Banned from theater showings for 40 days by the Korean Film Commission, Jam Docu Gangjeong just recently received approval (January 31st) for showing in South Korea. An update: Many of you are aware of the crisis on Jeju island at the village of Gangjeong, which was selected as the site for the construction of a South Korean naval base for use by the South Korean and U.S. military. Most likely within the next 24 hours it will be decided whether 400,000 tons of explosives will be dropped on the islet of Gureombi just off the coast by Gangjeong village. Please support the villagers struggling to protect their island from destruction! Here is an action alert that came out today. Thank you for taking action yesterday. Emails made a huge difference. 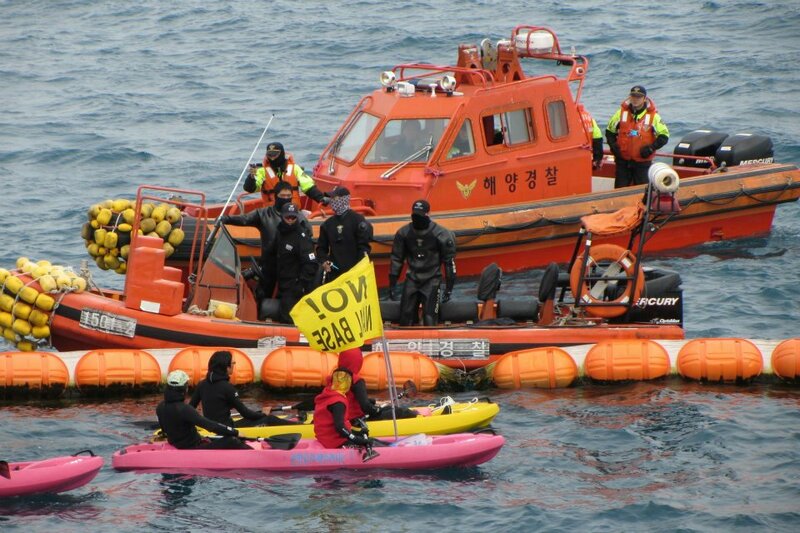 Today, Governor Woo of Jeju Island demanded postponing the blasting of the sacred Gureombi rocks, but the South Korean Ministry of Defense has refused to comply and is violating Korean law by moving forward in the project without the consent of the governor. The blast is set for “around March 8,” Korea time. That’s Wednesday for those of us on this side of the Int’l. Dateline. Several buses carrying dozens of riot police have been shipped in from the Korean mainland to handle protestors anticipated at the blast of Gureombi Rocks. The blast will require 400,000 tons of explosives. People from all over the world are shocked and disturbed that the government of South Korea would consider building a navy base on Jeju Island. 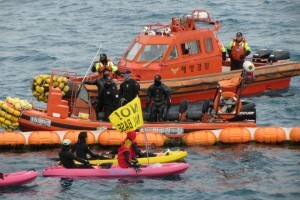 It is a moral crime to cover Jeju’s fertile farmlands with concrete, and to destroy its rare, soft-coral reef. The Gangjeong villagers depend on their farms to live, and the planet depends on healthy reefs to live. Jeju-do is sacred to all the people of the world, not only to the Korean people. Please do not allow Jeju Island to become militarized. If current tensions between China and the U.S. escalate in the South China Sea, if there is a naval base, the first target of attack by China will be Jeju Island. Please stop the militarization of Peace Island. The South Korean government needs to listen to its people and not build a base to port US Navy Aegis missile destroyers and aircraft carriers. Please protect Peace Island and DO NOT BLAST THE GUREOMBI ROCKS! STOP CONSTRUCTION OF THE NAVY BASE!